William Least-Heat Moon wants to put the miles between him and his troubles, and we're going along with him like a fly in his van riding shotgun. For a reference point on our journey, click on the thumbnail to get to the interactive map. "...through the old statehouse town of Corydon, I drove to get the miles between me and home. Daniel Boone moved on at the sight of smoke from a new neighbor's chimney; I was moving from the sight of my own. Although the past may not repeat itself, it does rhyme, Mark Twain said. As soon as my worries became only the old immediate worries of the road - When's the rain going to stop? Who can you trust to fix a waterpump around here? Where's the best pie in town? - then I would slow down." Marker commemorating Indiana's first capitol at Corydon. Photo by Kathy and her Buckethead H., on http://travel.gather.com. Click on photo to go to site. The quote above cites one of my favorite authors, Mark Twain. The idea that the past does not repeat itself, but rhymes, appeals to me on so many levels. I've faced this in many aspects of my life. You hear the phrases "the more things change, the more they stay the same," or "we are doomed to repeat our mistakes." I think that these phrases touch on part of Mark Twain's idea. For me, when it seems that I finally get a handle on things, especially those situations that really set off negative reactions or times of self-despair or even self-destructiveness, I go through a learning process. I think to myself okay, I know how to handle these situations in the future and I will never go down that road again. But other situations come up that bring on the same negative consequences in my life. The situations seem different, but once you peel through layers of disguise, connections begin to reveal themselves. Only after I've gone through the whole damn process again do I realize that indeed, I was just relearning what I already learned. It can be very frustrating and maddening, but after the fact, I realize that Twain's rhymes were there if I'd only recognized them. I don't know about any of you, but I have some of the spirit of moving on when one has the "sight of the smoke of a neighbor's chimney." I am an introvert, and am often uncomfortable around large groups of people. In addition, I grew up in a small town, and it's taken about twenty years for me to get used to living in cities. My wife despairs of me sometimes, because she loves to take advantage of cities and I, if left to my own devices, usually don't do the things that cities offer best - live music, theater, restaurants and other activities. Were I living in Daniel Boone's time, I might have done what he did and moved on when people got too near. But I'd probably come back from time to time, because I like people. As did Daniel Boone, who was largely responsible for settling Kentucky and served in the politics of the state in his later life. Don't we often do that, whether or not we live in a city, or on a remote ranch somewhere? Humans seem driven by the need for people, and companionship, but also a need for our own space. This causes some interesting clashes, especially in our society where the old frontiers defined by seemingly limitless geography have given way to the new frontiers defined by how far we can go in the electronic, virtual world. People immerse themselves in computer activities, such as I do in this blog. It's a solitary thing that divorces us from the reality around us. A young man plays World of Warcraft and doesn't talk to another live human for weeks. A woman builds an avatar and disappears into Second Life. Yet even as they divorce from reality, they seek community in these places. Facebook is the most popular social networking site on the internet, with millions of people seeking companionship in their Facebook friends. World of Warcraft is interactive gaming with others, all solitary, sitting at their computers and connected to each other in the game. We don't often hear of the Daniel Boone's of this frontier, though some have decided to chuck it all and go "off the grid." We tend to think of them as a little crazy. I don't know whether this aspect of our society is bad or good. I think the lack of real community is a negative, but you can't help but admire the new and innovative ways people are finding each other. Someone like William Least-Heat Moon, even as he drives to put the miles between him and home and the problems he is running from, can't help but pass through towns like Corydon, reminders that the world exists and that we can always plug back into true reality when and if we must. Ho about a little information about Corydon? It was the second capitol of the territory of Indiana, and the first state capitol. It was also the site of the only Civil War battle in Indiana. For those of us into 70s television, the town was the birthplace of James Best, better known as Roscoe P. Coltrane, sheriff in the Dukes of Hazzard (the original TV series). The town is also known for its festivals and town activities. So, there's a bunch of reasons to stop there! Meandering eastward, we journey with William Least-Heat Moon through the backroads of southern Indiana. Click on the map to see our journey thus far. "On through what was left of White Cloud..."
There really isn't much to say about White Cloud. In one way, White Cloud is a symbol of the forward march of life and time. White Cloud was once a town, and now it really isn't. It sits, unincorporated, in Harrison County, Indiana. Harrison County was named for the ninth president of the United States, William Henry Harrison, who once owned much of the land in the area. Even in a country as young as the United States, there are remnants of life and evidence of time's passage all over. In New Mexico, where I live, there are many ghost towns littering the landscape, products of booms then busts in precious minerals. You can find evidence of such places all over the West. Perhaps the price of the mineral being mined suddenly dropped, the mines closed, and the people drifted away to other more profitable ventures. Perhaps a promised rail line didn't materialize, and the life blood of the town was cut off. My wife and I recently stayed in a bed and breakfast in Chloride, New Mexico. It was an amazing place, now populated by only about a dozen families, but around 1900 had 5,000 people. The town was built around silver mines. It had a newspaper, saloons, a general store. But by the 1920s, the people had drifted away, the paper had closed down and the general store was boarded up and left, with all its merchandise still inside. It is now a fascinating museum stocked with most of the merchandise that was left. I co-own some property with my sisters near what isn't even a ghost town anymore, but around 1900 there was a thriving community built around a lumber mill in Northern California. The town, Irmulco, was named for the Irvine and Muir Lumber Company. Old pictures show a sawmill with a small train to carry logs from the logging areas into the mill. However, the mill was built to be portable. When the area was logged out, the mill moved, and the town disappeared. All that are left are some very old and crumbling wood buildings, the foundation of the sawmill (with indentations still in the grass where the sawmill once sat, a crumbled dam used to back up Olds Creek where the logs were floated until ready to cut, and an old roadbed and track bed. One can still find artifacts from the times - a huge steel circular saw, old beer, soda and occasionally, medicinal bottles. Once, I even found a penny from the 1900s stuck on a horizontal support beam in the shelter that served as a railway station. Everywhere you go, there are remnants of humanity that have gone by and disappeared, from the pueblo ruins in the Southwest to the forgotten and buried subway stations in New York City. I'm fascinated by these remnants of the past. They are the true time capsules that, when we discover them, give us a glimpse of what life was like. William Least-Heat Moon only gives a passing mention to White Cloud, but even a mention of a forgotten place contains whispers of what it once was, if we bother to listen. This is all I could find, folks. White Cloud continues to hold its secrets. You can also find information individual region's ghost towns on Google, Bing or your search engine of choice. Moving across southern Indiana, we follow William Least-Heat Moon in the initial stages of his journey around America. Click on the thumbnail of the map for visual reference of our location. It's also interactive, if you click on the points. Feel free to follow along the tours on Google Earth, accessible by the link on your left. I have fixed the link problem with the Kerouac Google Earth tour, so check that out as well. As always comments welcome, via the link at the end of this post. In case you're wondering why sometimes my posts deal with the place, and sometimes not, here is the explanation. I am sharing with you my thoughts as I read, not simply providing information about the places that I am listing. I always give links to learn more about the place, but the posts are simply what comes to my mind after reading the passages. That's what the "tour" in Littourati is about. The words take me on a tour of someplace in my memories or experience, and I share them with you. I hope that through all of these elements, the literature, the maps, and my reflections, the readers of this blog will find something of value. "On past the old stone riverfront houses in Cannelton, on up along the Ohio, the muddy banks sometimes not ten feet from the road. The brown water rolled and roiled. Under wooded bluffs I stopped to stretch among the periwinkle. At the edge of a field, Sulphur Spring bubbled up beneath a cover of dead leaves. Shawnees once believed in the curative power of the water, and settlers even bottled it. I cleared the small spring for a taste. Bad enough to cure something." When I was young, I wondered where the Noyo River came from. It flowed in the summer along the eastern edge of our property with a deep greenish color that made the rocks in its bed look different underneath the water than when I pulled them out. It made little splashes as it rushed over a large pile of buried rocks and emptied into what we called our swimming hole. That section of the river was only half of the piece I knew about about it. It came from somewhere and it went somewhere. I knew where it went, but I didn't know where it came from. Where did it go? It went on about another 23 miles to its mouth in my hometown. There, the river was wider, deeper, and the greenish tint had a little of the blue about it. It was filled with fishing boats which used it as a safe harbor. Somewhere underneath the masts were the fishing boats of my uncles, the Norcoaster and the Kristy. Just about at the breakwater, the river met the ocean, and green gradually faded into the blue of the Pacific. Where did it come from? That, I didn't know. I knew that in the winter, the river could be a raging torrent. In the summer, it was a serene placid creek. My father said that it came from springs farther upriver, but I never saw those springs, and I never understood how so much water could originate from what sounded so small: "springs." I can't remember when I saw my first real spring. Perhaps it was along the Mule Ears Trail in Big Bend National Park, where suddenly in the middle of the desert a blooming oasis appeared, complete with the sounds of numerous insects buzzing around. Perhaps it was on my many hikes in my native Northern California, but I didn't take the time or register what I was seeing. Yesterday, my wife and I and some friends made a hike in the Sandias, the mountains against which Albuquerque is nestled. We chose to hike on the Armijo Trail because Toro Spring could be found at the end of the trail. Unfortunately, some of my friends weren't in prime hiking shape, and the trail to the spring from the end of the Armijo Trail was a bit rough. I had seen the spring before, basically a hole in the ground, surrounded by some rocks, where water bubbled out of the ground and became a small creek rushing down into the little Armijo Valley. It is a serene placid place. It still amazes me that water just appears out of nowhere, just some hole in the ground, and within a few yards becomes a stream that eventually becomes a river that eventually ends up in one ocean or another. Springs are awfully symbolic. A life-giving substance, so elemental to existence, welling up from the earth like a gift, quenching our thirst or curing us of maladies, before rushing off to others farther down the line. We drink, we expel it, it goes back into the earth or evaporates into the atmosphere, and becomes once again the water we gratefully drink on a hot day. William Least-Heat Moon, despite the awful taste of the sulphur spring, touches the circle of life even as he starts his circular journey, rushing off down the road like the rivers and streams rush on through life. A little about Cannelton, a small city of less than 1500 people. The cotton mill in Cannelton was once the largest industrial building west of the Alleghennies. In 1960, a Northwest Orient flight crashed near Cannelton and Tell City, and a memorial has been placed eight miles from Cannelton. While a lot of theories, including a bomb, were looked at, it was eventually determined to be caused by an in-air detachment of the wing due to a flutter. I just saw a comic strip the other day with William Tell as its subject. He seems to come up a lot in the comics as I've seen a few strips with him as the subject. The reason I mention this? William Least-Heat Moon drives through his namesake Tell City along blue highways. Follow us by clicking on the map. "At the Huntingburg exit, I turned off and headed for the Ohio River. Indiana 66, a road so crooked it could run for the legislature, took me into the hilly fields of CHEW MAIL POUCH barns, past Christ-of-the-Ohio Catholic Church, through the Swiss town of Tell City with its statue of William and his crossbow and nervous son." I never chewed. While friends around me would pull out their cans of chew, grab a pinch, and stuff it their cheeks until it looked like they had some kind of growth on their face, I would simply watch. We'd talk, and they'd take a second to hold up a can or a bottle near their lips, spit the juice into the the can, and then put the can down to continue talking. This was especially dangerous at parties, where if a person put his or her can of beer down, momentarily forgot where it was, and reached for the can at hand, an unpleasant surprise might await with a healthy swig. Speaking of that, here's a good song by Robert Earl Keen titled Copenhagen. It extolls the pleasures and pain of chewing that particular brand. Of course, most of my friends weren't chewing Mail Pouch tobacco. I think I would have actually thought that was pretty cool if they did. That would have been way too retro for my friends. Instead they were chewing the cheap and popular stuff. The lightweights were chewing Skoal, which I remember had a minty smell to it. The harder core kids chewed Copenhagen. You were a real wimp if you used the packets that looked like little teabags with the pre-measured amounts of tobacco. The only guys I saw chewing tobacco from a pouch were older men, and the tobacco looked a lot different, more stringy and leafy. One of the great pleasures of traveling back roads of America, which Least-Heat Moon (LHM) captures in this quote, is driving through small towns and through pastoral settings where you can still find gliimpses of old highway advertisements painted on the sides of buildings, like the Mail Pouch ads on the sides of barns. It brings to life old time advertising, before television and radio were big, and in a more picturesque way than the lines of billboards that we have lining the interstates today. The old ads conveyed a simpler time, when people and life traveled much more slowly. 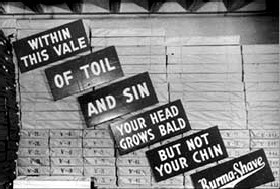 There was even room for creativity, as the old Burma-Shave signs on the side of the road that spelled out complete ads a few words at a time as you traveled down the road. And then, the towns, where ads were strategically painted on the sides of buildings, and often outlived the companies whose products they advertised. Occasionally, on a walk through my hometown, or in the city where I now live, I'll come upon one of those ads and be momentarily transported back to the time when the ad truly meant something to the people who saw it. The other thing that LHM, in his eye for detail, focuses briefly on is the statue. Every town has a statue or a monument to something, and these are often interesting to look at especially if they are a little out of the ordinary. In Tell City's case, as it was named for William Tell, it has a statue depicting the legend of William Tell shooting the apple off of his son's head with an arrow. In my hometown it was a section cut out of a huge redwood log with markers at rings representing significant years in human history. My wife and I were once traveling in Florida, and stopped off in Kissimmee to see the Monument of States. Basically, this was a pylon of rocks cemented together. Each rock was contributed by a state in the United States, and therefore it represented the geologic variety of the whole country. It sat forlornly, off on a side street near the water, and I had the distinct feeling that not many people went there. Just before the passage I quote above, LHM writes: "Life doesn't happen along interstates. It's against the law." If you are going to see some of these relics of earlier times, you have to cut down your speed and drive the smaller roads.